This type of case is proven to be both rugged and durable. While the inner walls protect any sensitive or delicate equipment parts, the outer walls absorb impacts and provide protection. Because the walls are independent of each other, the double wall carrying case provides superior functionality. If cost is a consideration, blow molded cases are available at relatively lower price points. These thermoplastic cases are manufactured with double wall construction from high-density polyethylene plastic, the most common plastic. They are corrosive and chemical resistant, Lightweight and compact, they are also recyclable. This type of plastic is pliable when heated, becoming rigid as it cools. In the manufacturing process, the plastic is blown into a mold. The resulting case is uniform and durable. It is also seamless and this construction results in a higher degree of protection for the contents. The thermoplastics used in double wall carrying cases are known for being long-lasting. This is the same plastic used in Lego’s manufacturing process and also in Ameripack products. The blow molding process has long been proven to be reliable. In fact, many mass-produced glass products are manufactured using the same system. 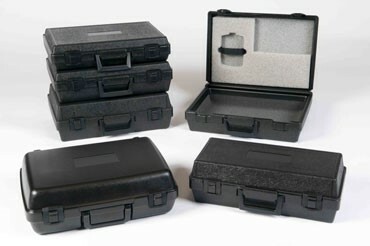 Blow molded cases allow you to have peace of mind and confidence as you store, carry and travel with your equipment. Their primary advantages are that they are strong and resist damage caused by impact, they resistant to chemicals, are flame retardant, and survive low temperatures.